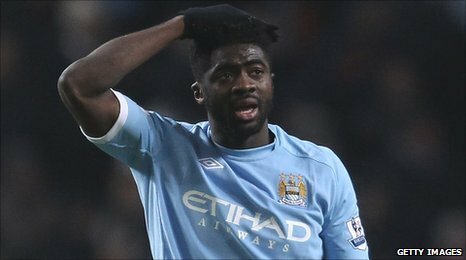 Manchester City defender Kolo Toure has been suspended after testing positive for a specified substance. The 29-year-old was informed by the Football Association after being tested at the Manchester derby last month where he was an unused substitute. The World Anti-Doping Agency (Wada) defines a specified substance as one that is "more susceptible to a credible, non-doping explanation". The punishment for this offence ranges from a warning to a two-year ban. After Toure's A sample returned positive, City confirmed in a statement that the player had been suspended "pending the outcome of the legal process". Toure has until Wednesday, 9 March to decide whether or not he wants a B sample to be tested. If he does and it comes back negative then the case would be closed and Toure regarded as not guilty. However, if he does not then he will have to submit an explanation and would face a lengthy disciplinary procedure. BBC sports news correspondent Dan Roan told BBC Radio 5 live: "A specified substance, according to Wada, is one more susceptible to a credible, non-doping explanation because of its general availability in medicines. "It could be some kind of stimulant or dietary aid and that would tally with what I was told on Thursday night by sources close to Toure - who insists it was not deliberately performance enhancing or recreational. "Given that Toure is a devout Muslim and is also teetotal and the fact he is regarded as a model professional and one of the quiet men of the Premier League, it seems to add up." Since football signed up to Wada's code, testing has become more stringent and targeted, and ignorance is not regarded as a defence. Hamilton Academical midfielder Simon Mensing recently served a four-week ban after a specified substance was detected in his system. However, former Sheffield United goalkeeper Paddy Kenny served a nine-month suspension after testing positive for the stimulant ephedrine. It took two months for the case to be heard and the player's defence of the drug being present in cough medicine was dismissed. Roan added: "There seems little doubt Toure's season is over, it's now whether or not his entire career at Manchester City is in jeopardy too because he could face a two-year ban if he's found guilty." Ivory Coast international Toure, whose brother Yaya also plays for City, is a former club captain who joined from Arsenal in July 2009. The defender has gone on to make more than 50 appearances for City, although he was not involved in Wednesday's FA Cup victory over Aston Villa. The failed test automatically triggered the suspension and it is understood that Toure was left out of the squad because the club had been made aware of the situation. City added in the statement: "There will be no further comment from the football club at this stage." And on Thursday evening the FA said in a statement: "The FA can confirm that a player has been provisionally suspended from playing pending investigation, having tested positive for the use of a prohibited substance." Mensing, 28, tested positive for the stimulant methylhexaneamine at the end of January and subsequently missed five matches after a period of ineligibility was imposed on him. The player maintained he was unaware he had ingested the substance while using a dietary supplement - an explanation which was accepted by UK Anti-Doping. In Kenny's instance, Christopher Quinlan - the chairman of the Regulatory Commission which heard the case - said that a professional sportsman "has a strict responsibility to ensure prohibited substances do not enter his or her body". Toure was the skipper of City until the start of the current season when the armband passed to Carlos Tevez. The Ivorian defender was brought to the Premier League by Arsenal in 2002 and he remained with the London club until his £14m transfer to City. Toure, who is under contract with City until the summer of 2013, was one of several high-profile arrivals in the summer of 2009 as then-manager Mark Hughes spent more than £100m on new players. City are pursuing trophies on three fronts. They play Reading in the FA Cup quarter-finals, meet Dynamo Kiev in the last 16 of the Europa League and lie third in the Premier League, 10 points behind leaders Manchester United.